Digital Transformation: How to Do it! Dragon1 is a new digital platform and supports executives in doing what they do the best: make the company grow and produce better services and products every day to satisfy customers. Want to check out the features? If you are a Member of the Board of Directors of a Hospital, a Vice President of a Large Bank or a CEO of a Telecom company, you need to know how you can achieve the goals of your organization at an acceptable cost. Do you know where the IT strategy has an impact on the Business strategy, so you will achieve the desired benefits? Do you know which projects contribute to achieving the goals or are there projects that do not contribute to the objectives agreed upon for this year? Do you know which management information and analytics relate exactly to which organizational domain or skill of your employees? Do you have an overall big picture? Do you know if you are spending money on the right things? Do you know that all organizations will be undergoing an IT transformation? This because new technologies enable so much more efficiency in your processes, services and information. And also because of the changing needs of your customers. They want everything to be fluid, digital and real-time, an Enterprise 4.0. There is no escaping that anymore! All the correct management information and useful reports to manage your company, can only become available if there is a solid basis. That solid basis are visualizations of models that contain your strategy data (on the left), architecture data (in the middle) and transformation data (on the right). And when this data changes, this overview and the other visualizations and documents or reports will be updated automatically. 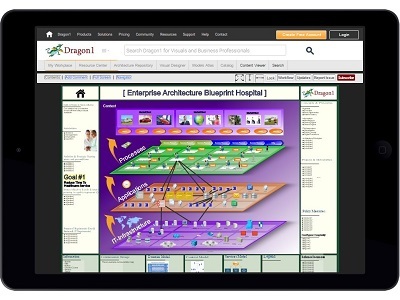 Let architects, managers and analysts start with Dragon1. So on Dragon1 the Business Professionals can create blueprints (of for example digital banking), landscapes (of for example lean processes) and roadmaps (of for example customer journey). 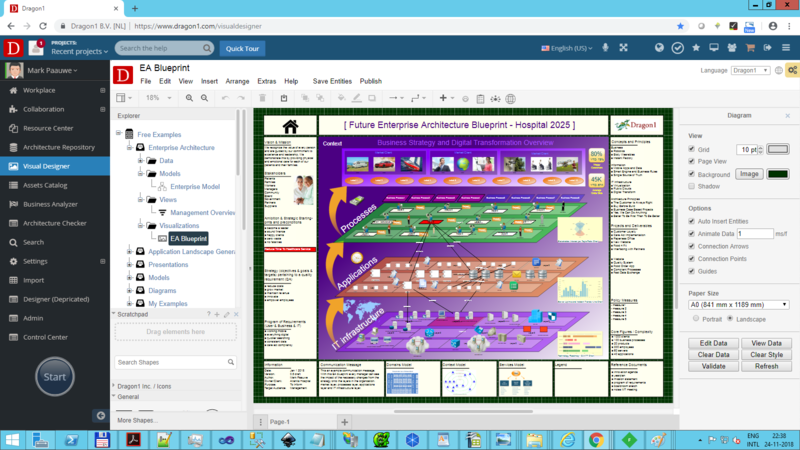 Large, integral A0 sized visualizations of the enterprise architecture of your organization. The unique thing is that you can also publish these visualizations to your mobile device so you have them available in an interactive way, anytime, anyplace, anywhere. 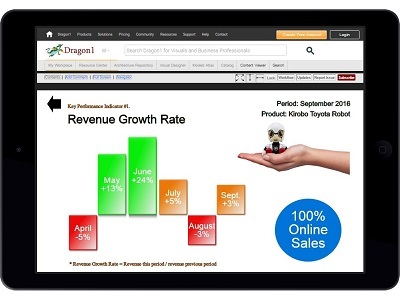 Dragon1 is an online SaaS Platform. 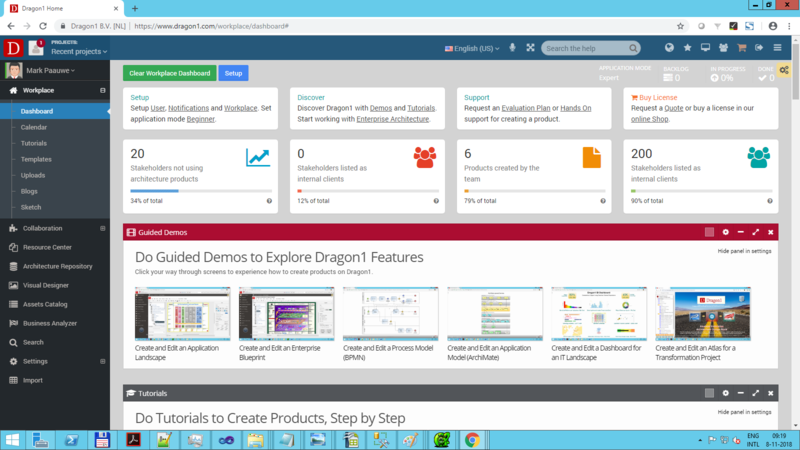 Dragon1 is an innovative product with which you manage integrally your goals, projects and the it transformation of your company or organization. Whether you are a small firm, a worldwide enterprise or government organization, you will use Dragon1 to successfully change your business and IT. 4. 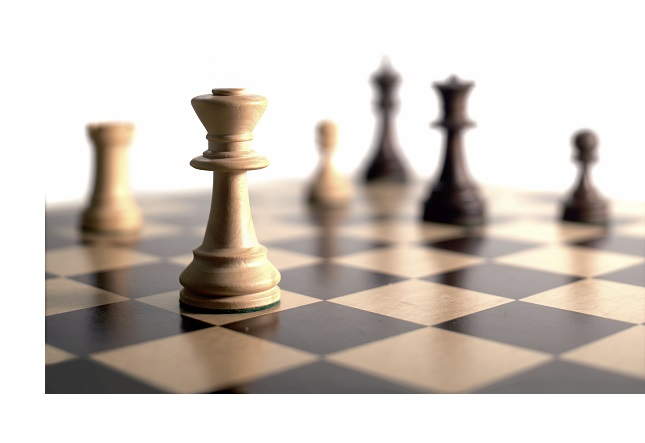 See how your Business Strategy is supported by your IT Strategy - real-time! On the Dragon1 Platform you can do many things. 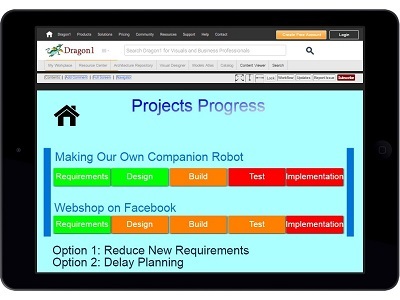 One of the most successful ways to use Dragon1 is to create a digital decision board, in collaboration, for the stakeholders, managers, directors and board members of your company. 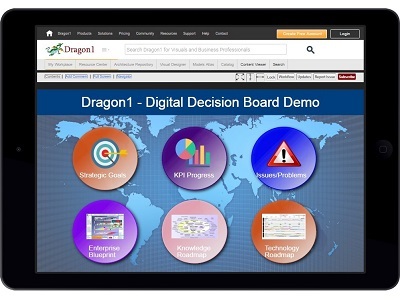 If you create a digital decision board, you will cash all the core benefits of Dragon1. 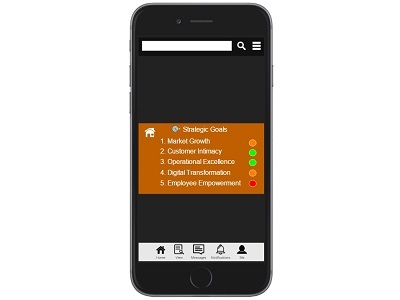 A digital decision board is a linked set of interactive visualizations showing the progress made on targets and KPIs together with overall views of the enterprise architecture, so you can see where in the organization the solutions and issues are related to the targets and KPIs. Do you know that this means you can manage with these visualizations! Suppose a target or KPI is not reached. 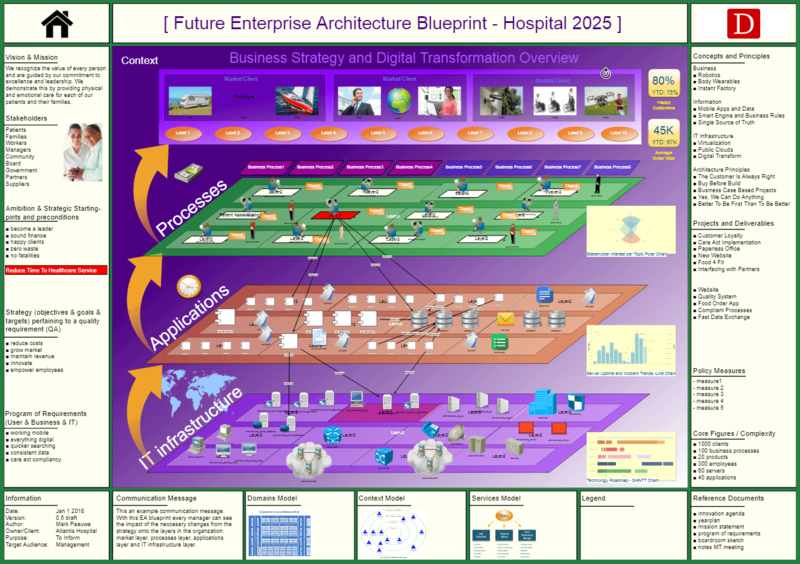 The overview visualization for example, the Business Strategy and Digital Transformation Overview, will tell immediately where the processes, competences, applications and infrastructure are present that block reaching your target or KPI. Now you can have these visualizations available in every management team meeting or board room meeting you are needed. 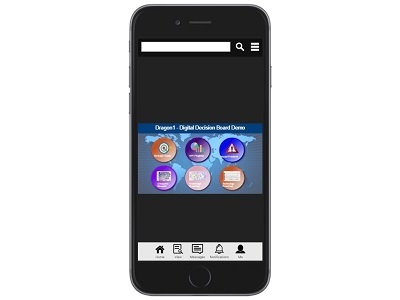 Dragon1 works on your Desktop, Laptop, Tablet-PC (iPad) and Smartphone (iPhone). In any browser. You may think that these visualizations will become very small on a smartphone, but because you can zoom in and out and change the views and viewpoints, you create effective and usable visual information constantly. 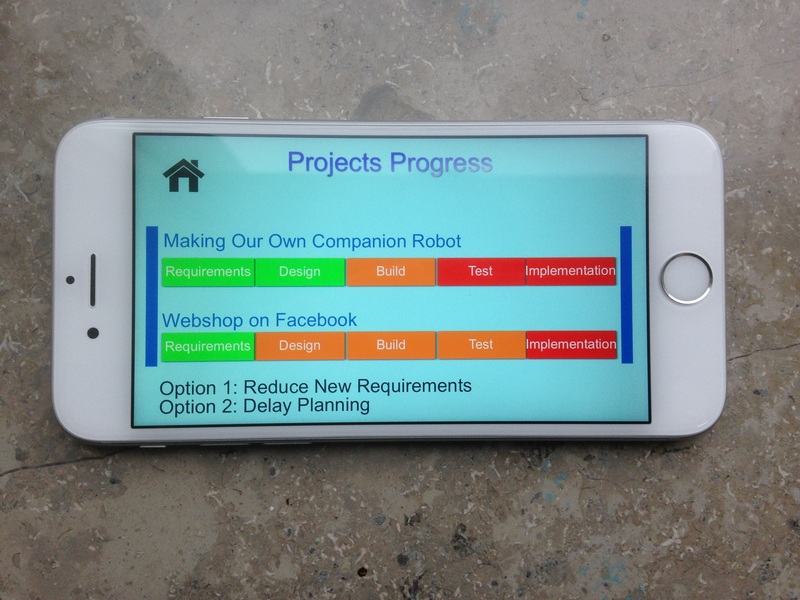 To increase your productivity in everything you do, we have built a projects and contact module and placed it in your workplace. For all the common products people create on Dragon1, like models, blueprints, roadmaps and landscapes, we have example projects for you. The digital workplace also enables you to create, manage and share tasks, contacts, calls, events, knowledge and documents. In other words: it is a real digital workplace. 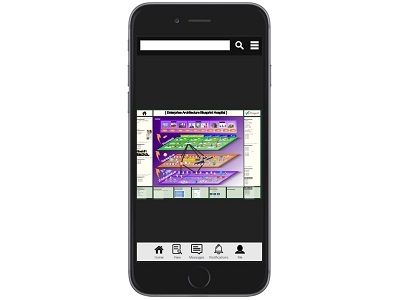 The big picture (A0 sized) above was created using the Visual Designer Web Application on the Dragon1 business platform. The diagram is available as editable template and the Dragon1 online software can be used in any browser and on any device. This increases productivity in your organization greatly.